2nd-6th December 2015 are the days for International Conference on World Peace with “Better Understanding for a Better World” as the main title. This year event is held in Convention Hall of Universitas Islam Negeri, Yogyakarta, Indonesia by the volunteers of Civilization Exchange and Cooperation Foundation (CECF) which the head office is based in US and supported by National Board of Yayasan Bina Antarbudaya. The event aims to spread awareness in creating a peaceful society in diversity not only locally, but also globally. This event was participated by around 170 participants. The second day of this event is full day conference and paper presentation in Convention Hall of UIN Sunan Kalijaga. Minister of Education and Culture, Dr. Anies Baswedan visited this conference and gave a special speech in the opening of the conference day. He stated that Indonesia is a very good country as an example of peace implementation in diversity. This blessing should be used wisely especially by the young generation to always be active in campaigning peace in the society. The important part of peaceful society is education. Because educated people would understand more that the diversity is not an obstacle to reach a peaceful life. “Peace is not about the absence of violence, but the presence of justice”, He stated. Education plays a role to boarden the people’s perspective and increasing the self justice to not easily judge but wisely being justice. 1. 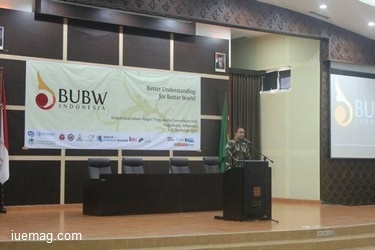 Dr. Irid Agoes (Board of Trustees Bina Antarbudaya Foundation) talked about Intercultural Learning Workshop. 2. Asmir Agoes (Chairman of Yayasan Bina Antarbudaya) talked about Leadership, he explained the meaning of leadership and 10 leadership teachings. He said that there was a term named Believe Wheel, consisted of Believe, Value, and Paradigm. Those three would create the state of mind perspective and success of leadership begins from it. 3. Dr. Muhammad Najib Azka, MA talked about Conflict Resolution. “It is very important to have courage to cross the border in order to build trust between the group”, Dr. Muhammad Najib Azka, MA said to conclude the session. 4. Imam Mohammad Bashar Arafat (Founder of Civilizations Exchange and Cooperation Foundation, USA) and Dr. Phil. Sahiron, M.A (Hermeneutics Expert, Comparative Religious Study Expert, Comparative Religious Study Expert Department of Qur’anic Studies Faculty of Ushuluddin and Islamic Thought UIN Sunan Kalijaga) talked about Global Citizenship. On the third day of the conference, there was a faith and culture trip. All participants went to Hindhuism temple, church, mosque, and vihara. Not only did the faith and culture presentation about all those religions but also a discussion. The Faith and culture Trip was ended in Bale Raos, we had dinner and panel discussion. On this discussion panelists are the representative of every different religion; Catholics, Buddha, and Islam. Through this session the participants are able to know the different perspective of every religion. After each of the representative delivers their speech, the participants are allowed to ask some questions and discuss it together with the panelists and the other participants. This panel discussion is a very important session of the BUBW conference because being understood of other religion is part of the whole understanding we need to have to achieve world peace. As what Imam Bashar said, as one of moslem panelist, this BUBW is a place where we discuss things and then do it in real action to help achieve world peace. No one is actually created equal, that’s why different should not lead us to have conflicts of one another. At the last day of the conference there was Focus Group Discussion in Women, Mining, and Communities. Then all participants went to make batik and had a trip to Prambanan. There were also performances from each group in the closing ceremony. To end the BUBW also announced awarding to the best participants, best paper, and all participants had their certificates. BUBW is a prestige event. Because it brings youth from various backgrounds, addressing many issues about leadership, global citizenship, and conflict resolution, and also emphasize the tolerance in theoretical and practical way are one of big actions to speak up and be part of the world’s solution. “From this event we all hope the message of peace and diversity is vastly approaching more people and wider communities”, said the PO of this program, Siti Nurul Sholikha. Any facts, figures or references stated here are made by the author & don't reflect the endorsement of iU at all times unless otherwise drafted by official staff at iU. This article was first published here on 18th December 2015.